The marketing for the James Cameron produced movie, Sanctum is really stepping up with posters coming out on a near weekly basis. If you haven’t seen the trailer for the movie, you can click here to view. Sanctum stars Richard Roxburgh, Rhys Wakefield, Ioan Gruffudd, Alice Parkinson, Dan Wyllie and is directed by Alister Grierson. It’s set for release in the UK 4th February 2011. 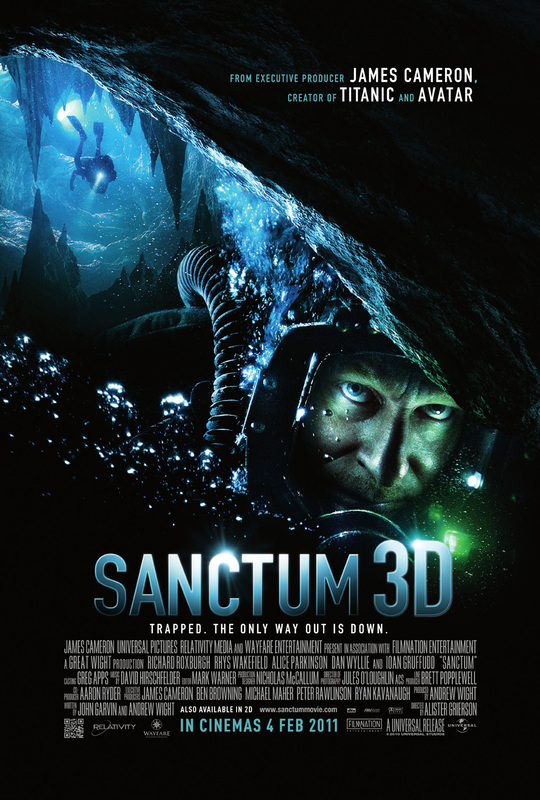 Synopsis: The 3-D action-thriller Sanctum, from executive producer James Cameron, follows a team of underwater cave divers on a treacherous expedition to the largest, most beautiful and least accessible cave system on Earth. When a tropical storm forces them deep into the caverns, they must fight raging water, deadly terrain and creeping panic as they search for an unknown escape route to the sea. Master diver Frank McGuire (Richard Roxburgh) has explored the South Pacific’s Esa-ala Caves for months. But when his exit is cut off in a flash flood, Frank’s team–including 17-year-old son Josh (Rhys Wakefield) and financier Carl Hurley (Ioan Gruffudd)–are forced to radically alter plans. With dwindling supplies, the crew must navigate an underwater labyrinth to make it out. Soon, they are confronted with the unavoidable question: Can they survive, or will they be trapped forever?